Chances are, you’re familiar with these things known as collars. Generally, you find them on these domesticated-ish animals. For the most part, these collars consist of a simple name tag and some basic contact information. The Petsafe Micro ID Rescue Collar is bringing collars into the 21st century– by putting a USB drive into the collar itself. What better format to use than USB? Even if you’re not a very tech savvy person, anyone who has an iPod or digital camera can recognize what a USB plug is and can figure out where to put it on their computer. On the drive, there’s more than your standard address and name, rather you can put loads and loads of detailed information. Maybe your pet needs medication, has a special diet, or likes to be rubbed in a certain place. No matter what it is, you’re able to give the most detailed information you could ever want (maybe a little too much) in the case of your pet being lost. Let’s just hope the person that finds it actually decided to give your pet back. 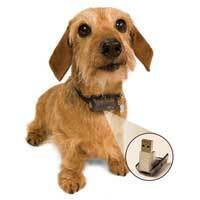 Now, you may be uncomfortable giving tons of detailed personal information in a tiny capsule attached to your pet. In that case, you can pay a yearly fee of $10 to have the company list a 1-800 number as your phone number and the company will act as a 3rd part between you and your dog’s rescuer. It’s probably easier to just give out your number though. The Petsafe MicroID Rescue Collar is available for $40. That’s not to much, especially if your dog has some medical condition that needs to be taken care of daily. I’ll stick to the micro injection. No yearly fee, all my info is kept securly in the Vet’s database, and I don’t have to worry about it getting wet, rusted, or shorting out.